Originally I’d planned on Morocco for that weekend, but it hadn’t panned out, and after hearing raving reviews of Lisbon from others who’d already been, it seemed to be the perfect option. “I’m so down,” I told Maya. Lisbon didn’t pan out either. Our group of five had waited too long to plan, and the only flights we could find were expensive and inconvenient. “Let’s look at other big cities in Portugal,” I suggested. That’s how we decided on Porto. Porto, or O Porto (“The Port”) in Portuguese, is the second largest city in Portugal, boasting a metropolitan population of 1.8 million – a far second to Lisbon’s 2.8 million, but certainly enough to put it on the map. Also helping to put it on the map is Ryanair, the cheap airline frequented by students like myself who don’t mind uncomfortable seats, bumpy rides, and very little baggage. They began direct flights there a few years ago, and since then its tourism has expanded. Luckily for me, that expansion included us. After exiting the cramped Ryanair flight – which this time had included theme music, applause, a moment during which I feared for my life, and a group of drunk men on what seemed to be a bachelor party – we met up with our Airbnb host, who just happened to work at the airport. He gave us the keys and tram directions, showed us a picture of his two-year-old son, and offered suggestions for nightlife and restaurants. I sank down onto the floor in a little nook by the conductor’s booth as soon as we entered the crowded tram. It featured enormous windows, and I was eager to bask in the sunlight and relax after a week of icy weather and rain in the Netherlands. I shifted for back support and directly in front of me was a couple – the woman slightly taller in her heeled boots, her mustard yellow jacket standing out against her significant other’s navy blue. His arm wrapped around her waist, and she held his back. They remained glued together for the entire ride, looking out the window and nuzzling each other occasionally. I eyed their neat red suitcases and imagined they were newlyweds, here for the perfect honeymoon. After approximately forty minutes and one easy transfer, we were exiting the underground portion of Porto’s main station, São Bento – just a two-minute walk from where we were staying. Our host hadn’t been lying. We were smack dab in the center of town. From where we were standing, there were at least six possible directions to go in. Behind us loomed the aboveground section of the station, one of Porto’s major landmarks. Built in a French neoclassical style, the exterior was majestic but a bit overshadowed by the structure next to it – a dilapidated building attached to a rocky hill, with broken down stone walls and rows of empty windows. In place of a façade, there was a sculpture of vertical and horizontal teal bars that intersected and undulated in waves so that some of the squares made by the bars were enormous, and some were small. I squinted up at the structure and wondered who had put it there – somehow, it fit right in. After finding our Airbnb (small, but great view) and freshening up, we headed out on the town just as the day became dusky, following the directions our host had given us for good restaurants. It was an uphill climb on cube-shaped cobblestones, avoiding the odd empty indention from a stone that had come loose. We passed storefronts promising wedding dresses, tiles, and jewelry until we found ourselves in a park with a reflective pool lined by trees. A wooden bridge led to a central man-made island, housing more trees and a stone bench. 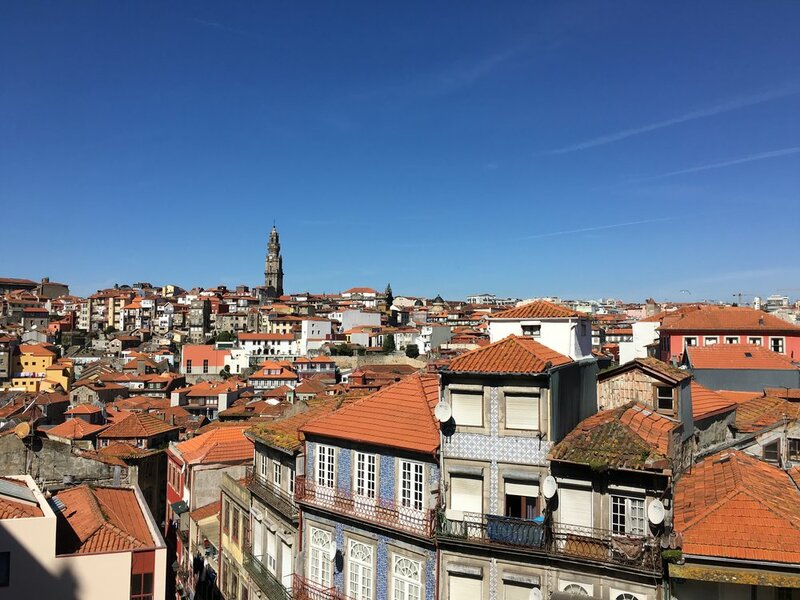 We came out into a wide plaza housing what I had already surmised were buildings in Porto’s typical style; tiled facades, small wrought iron balconies, big windows, and planters growing flowers or herbs. They were all attached in long cement rows, though differing in height. The tiles also varied: some were solid colored, but most were patterned or designed with blue and white historical scenes. On residential buildings, they surrounded the windows and changed from floor to floor. Some larger buildings were entirely covered in tiles. I had never before appreciated tiles. I had never before seen tiles like this. They were Azulejo tiles, brought to Portugal by King Manuel I in 1503 from Seville, where they’d been around since the 13th century, when the Moors ruled Spain. The word “azulejo” comes from an Arabic word meaning ‘polished stone.’ They became an essential part of Portuguese architecture, as they were both practical – temperature control – and able to beautify any blank space with relative ease. We stopped at a café with red tiles and had our first pitcher of sangria with dinner. The evening festivities had officially begun. The night was a blur of strong sangria (among other drinks) and nonstop dancing to a mix of songs in English, Portuguese, and Spanish – regardless of the language, the beats were decidedly sick. That was all we needed. We club crawled to four different clubs, each with its own signature style, but the one we ended the night at was my favorite. Lights of pink, green, purple traveled through the tangles of moving bodies, and the high ceiling held disco balls of varied sizes. A jumble of smiles, sweaty limbs, and shiny hair boogied to the beat on an elevated platform, a stage of sorts for those who wanted to be seen. Maya and I joined them. I rose early the next day while my travel mates slept off their hangovers and set off to explore. Though Porto was a substantially large city, it felt more like a smaller town. I got lost in sloped alleys lined with more narrow, tiled facades. I went up a steep stone staircase to discover a panoramic view of red roofed perfection. Laundry dried from open windows. Abandoned bottles and other relics from the night before were scattered on the streets. My stroll brought me to the oldest part of the city, where dilapidated stone was renewed by colorful graffiti, and the Douro river. The sun was just beginning to warm my chilled skin and I leaned over the railing to watch its reflection in the river. I went back into the winding streets. They were a little messy, a little disorganized, but it was almost a purposeful mess, the kind that was pleasing to the eye. We don’t worry here, the sun seemed to say, we enjoy life as it comes. Around nine, shops began to open, and only then did street cleaners begin washing away the night’s mistakes. I thought of Boston’s 5 am street cleaners; no imperfections allowed in the daylight. I appreciated the openness of these far more reasonable working hours. The rest of my day was eventful. We packed in a stroll through more of the city, a visit to Livreria Lello, the bookstore of gilded fame which was rumored to have inspired J.K. Rowling’s descriptions of Dumbledore’s office, a bit of shopping in an open air market where sellers laid their products – jewelry, sunglasses, vintage posters, and, of course, tiles – on colorful tablecloths, and a visit to the nearby Miramar beach. We took a thirty-minute train from São Bento, learning that its interior was really the part to write home about – over 20,000 Azulejo tiles showed Porto’s history in shades of blue. Miramar’s light brown sand contained piles of sticks, rocks, and shells, but the sand didn’t need to be pristine because the ocean it led to more than made up for the crunch beneath my feet. The water glittered in the bright sun, and though it was too cold to swim I could taste the salt in the air. The waves rose and crashed with a passion. It was high tide. The beach was a famous one, known for the 17th century Capela do Senhora Pedra chapel, which rose from a rocky formation that sometimes jutted from the beach – in the time we were there, the sand that surrounded it gradually became shallow water. I ascended the steps before that, though, and watched the waves beat furiously against the hulking boulders. Being in Porto made me breathe easier, accept every minute as it happened. I did not think about the stress that would greet me upon my return, as I often had while visiting other beautiful cities. The pigeons and seagulls existed harmoniously, crowding together around statues and sidewalks. The tiles that decorated the buildings made them distinct – no façade was the same as any other, yet they combined to create rows of delightful asymmetry. My visit to Porto was almost accidental, but somehow it felt like fate. Porto was not just a city. Porto was a feeling.